A super-enormous spending bill gets press attention, so I’ve been talking with the media these days (1) regarding recent health insurance premium rate increases following the enactment of health reform, which is estimated to cost approximately $250 billion per year once fully realized. While rate increases by Aetna and certain Blue Cross and Blue Shield plans correlate with the recent passage of health reform, it is hard to believe health reform is the cause, at least not entirely. 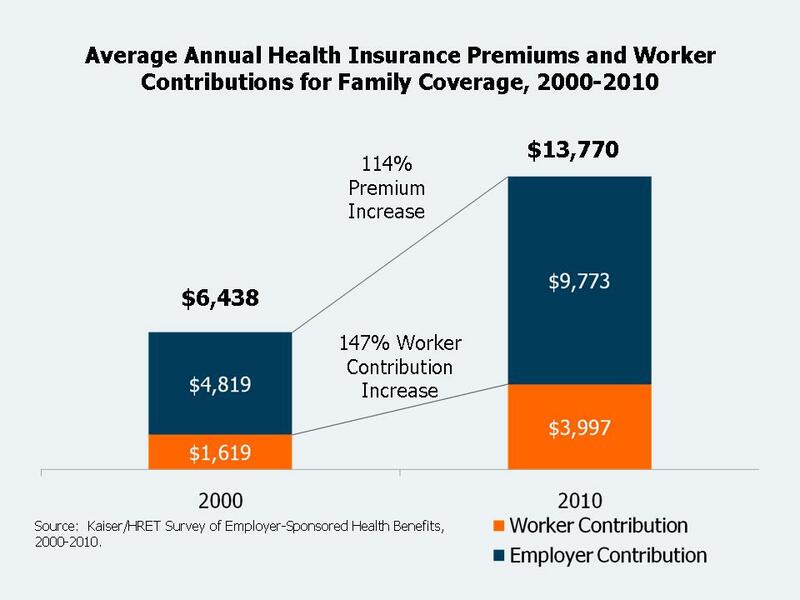 The fact is that health insurers have been raising premiums at hard-to-believe rates for well over a decade. The primary cause then and now is runaway healthcare inflation. It is true that for the most part insurers, like any other business, look to maximize profits, but most markets for health insurance are extremely price competitive. Generally it is the increase in expected medical expenses that drive rate increases, and unfortunately demand for medical care has been increasing at approximately 3x the rate of general inflation. From what I can tell this will continue forever until fundamental structures in the healthcare system change, so expect ongoing rate increases from insurers to persist, despite the political pressure. A recent study by the Kaiser Family Foundation, while subtle in its presentation, is astounding in its exposition of runaway medical inflation’s impact on health insurance premiums. Take a look at the charts below. From just this small amount of data it is clear that health insurance premiums have been sky rocketing for almost two decades. US inflation averaged 2.4% per year, while health insurance inflation has averaged 7.8% per year, with the brunt of this premium increase being absorbed by employees at an average rate of 9.5% per year. Wage increases have essentially kept up with inflation, meaning the annual disposable income of the average insured family, in real terms, was reduced by nearly $2,000 over the past decade as a result of medical inflation. W/r/t employers, their bills rose at 7.8%, about 3.25x their ability to raise prices. Result: employees and shareholders are getting squeezed. Why so much medical inflation? There are lots of little reasons that emanate from one major trend: we (the US and its medical profession) keep getting better and better at keeping people alive. Today there are an astounding number of ways to restore, repair and fine-tune humans. “Take two aspirin and call me in the morning” is all but gone. We now understand thousands of causes of the headache, from too much protein in the diet, to brain tumors, to meningitis, to stress, to something called Syringomyelia ($1 to the first reader that knows what this is, and no fair if you are Neurologist), and so on. We now know so much that we are increasing exponentially the things that doctors can restore, repair and fine-tune, creating treatments for ailments, many of which were once life-threatening that are now survived regularly, leaving us with an older and sicker population that costs more and more to fine-tune every year. In short, much of our medical inflation is a symptom of our amazing technology and our wealth. Modern medicine, while an awesome exposition of human inventiveness, is slowly and steadily eating away at the more productive sectors of our economy that created the means for such inventiveness in the first place. If the “it” is invention, the answer is clearly no. We will forever be extending our life expectancy and reducing the health and fitness levels necessary to achieve it. Medical invention will not be stopped. If the “it” is medical inflation, the answer is not anytime soon. Patients evolve toward more active, cost and quality conscience consumers of healthcare and health insurance. Insurers evolve to managers of health risk rather than pure underwriters. Providers evolve their business models from a strict fee-for-service reimbursement model to a more pay-for-performance model, like most advanced industries (will doctors offer one-year warranties? – why not?). Such an evolution spawns subsets of ideas like wellness, care management, value-based health insurance, healthcare information exchanges, insurance exchanges, provider pricing based on quality scoring, telemedicine, and on and on. I have been and will be discussing them all with the understanding that without meaningful progress medical inflation is here to stay. Expect it (healthcare inflation) to continue at about 8%, so in 5 years our average family will cost about $20,000 or more a year to insure. (1) Here are a couple of links. First an brief piece on medical inflation from TheStreet.com along with a podcast interview (download the podcast titled “Best (and Worst) Bonds, Insurers and Obama, Gold’s Rush” – my segment comes in around the 23:00 mark).